The 48th Annual PlayStation Fiesta Bowl will feature a first-ever matchup, as No. 11 LSU and No. 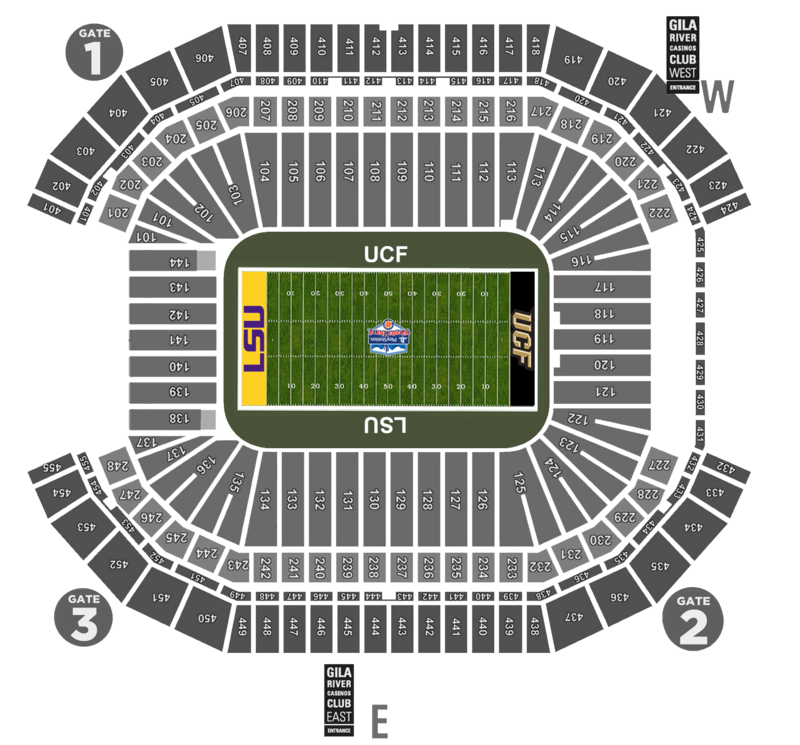 8 UCF will face off for first time in history in a Tuesday, January 1, 2019, College Football Playoff New Year’s Six contest at State Farm Stadium. Every ticket purchased for both the PlayStation Fiesta Bowl and the Cheez-It Bowl helps to support Fiesta Bowl Charities, which has given over $12.5 million to the Arizona community in the last eight years in charitable giving, including $2.5 million for the 2018-19 season. Fans that are interested in ticket and hospitality packages for the PlayStation Fiesta Bowl can purchase packages and resell tickets through PRIMESPORT, the Official Ticket Exchange and Hospitality Provider of the 2019 PlayStation Fiesta Bowl. Parking can be purchased through the Fiesta Bowl website. It wouldn’t be college football without a proper tailgate party. Join tens of thousands of other college football fans at the PlayStation Fiesta Bowl Fan Fest Pregame Party on the Great Lawn at State Farm Stadium. Fans of all ages can experience some of the greatest pregame traditions like pep rallies and performances by marching bands and cheerleaders, interactive games to play and, of course, plenty of food and beverage booths to get you ready for the big game. Prior to the PlayStation Fiesta Bowl fans are encouraged to explore the various on-site pregame options for the PlayStation Fiesta Bowl – the Fan Fest Pregame Party is free with a PlayStation Fiesta Bowl game ticket or the ticketed APS Stadium Club Pregame Party. Availability is going fast for the APS Stadium Club Pregame Party at State Farm Stadium, set at $100, which will elevate any tailgating experience and feature big-screen televisions, live entertainment and an all-you-can-eat buffet right up until kickoff time. Kick your pregame festivities up a notch at the Fiesta Bowl Stadium Club Pregame Party in an exclusive area located on the Great Lawn at State Farm Stadium. Stadium Club is unlike any other tailgate you have ever experienced, offering big screen televisions, live entertainment, an all-you-can-eat buffet and seven complimentary drink tickets. Creating the ultimate game day atmosphere, Stadium Club offers the best value of any tailgate party around. Offering a vibrant outdoor setting with unique water features, Westgate Entertainment District delivers an interactive shopping, dining and entertainment experience. It is within walking distance, directly adjacent to State Farm Stadium, home to the Arizona Cardinals and annual Fiesta Bowl. LSU FANS: Salt Tacos y Taquilla will be the hub for LSU fans and alumni on Gameday and will be LSU friendly all weekend long. Please expect crowds before and after the game. On game day there will be LSU themed Southern Comfort drinks for fans, custom LSU Alumni decor, and a DJ playing all the fan favorites (fight song, etc.). Opening at 7:30AM and serving Bloody Mary’s, mimosas, and breakfast on game day. No cover. UCF FANS: UCF Alumni will host the official UCF ChargeOn Tailgate ahead of the PlayStation Fiesta Bowl at McFadden's Restaurant & Saloon! All alumni, friends and fans are invited to join. We'll have a hearty brunch buffet, drink tickets and appearances by UCF fan favorites. Advanced registration is required. What are mobile tickets? Mobile tickets are tickets delivered in a Mobile PDF or Apple Wallet format specifically designed for smartphones. Mobile tickets are emailed directly to you as a link within your email. You will receive two emails after your purchase – one will be your order confirmation (does not include tickets) and the second email will contain your mobile tickets that can be added to Apple Wallet or scanned on your smartphone for entry.